Your front doors serves several purposes in your home. It must be tough enough to withstand the elements such as rain, wind, heat and searing cold, yet beautiful enough to impress any first timers who look at your house. This is a combination of qualities that is often not very easy to accomplish. Most people simply go for sturdiness, since your front door is your last line of defense from intruders who may wish to come into your home. Others still, would rather go for functionality and forego the aesthetic value of the front door. Since the primary function of your front door is to protect your house, it is only prudent that you choose one that can carry out those duties with a certain degree of excellence all the while maintaining your home’s curb appeal. It is also a well-known fact that most people judge your home by the sight of your front door. So when choosing one, you might want to consider the resale value of your home and how your front door will affect it. Some of the things to consider when selecting exterior doors include: durability, aesthetic value, and of course, price. 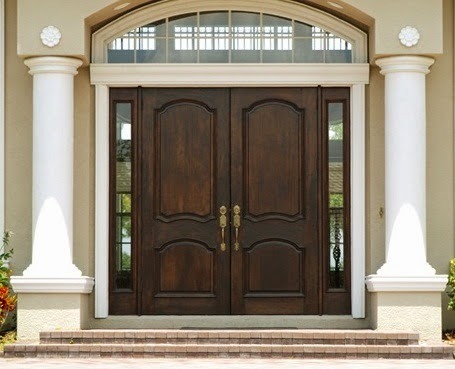 According to statistics, the most popular materials for front doors are wood, steel and fiberglass composite. Every single one of the materials has its pros and cons. Wooden front doors are simply exquisite. They are majestic, beautiful and have that element of tenure that comes with things from a past era. They also tend to be the most expensive. Some of the most common choices include wood veneer skins that are placed over a sturdy wood core. These tend to be a little cheaper and less prone to warping. If you do decide to go for this type of door, then you should 1/16 inch thick furniture grade veneer. Going for anything less than this could leave your door vulnerable to easy damage. What you need to bear in mind is that wood is vulnerable when it comes to the weather elements. Your door may warp, change shape and color over time or even seep in moisture that will cause it to rot. You should shop for high gloss finishes and durable stains. Be sure that the finish is applied to the top and bottom of the door edges to prevent it from taking in moisture. These represent some of the most durable doors known to man. Although they may suffer some dents, repairs are simple and involve auto body repair kits. Steel door can also help save the home-owner some money when it comes to the electricity bill. They have great insulating values that ensure you do not lose any heat during the winter. Although they tend to be cheaper than wood or fiberglass doors, steel doors are very vulnerable to the elements and can rust. They also need frequent replacing. They are, however, very sturdy and difficult to break into. This represents some of the most durable doors on the market today. They are relatively affordable and are almost maintenance free. Many manufacturers even offer warranties that last for as long as you are living in your house. Cliffside is a good source for almost every kind of door you might want and they offer great warranties. Fiberglass composite doors tend to be the best choice for harsh climates since they do not rust and are virtually invulnerable to the elements. This type of door dust not rusts, dent, warp or even rot. They can also be customized to look like wood or any other natural material. They are sturdy and very long lasting. They represent the best choice for anyone looking for durability with a low maintenance cost. Of course, when it comes to choosing your front door, the choice entirely depends on your taste and budget. But pragmatically speaking, you should go for something that is both durable and attractive. About the Author: Robert Bryant is a blogger and passionate writer. He likes to write about Health Issues, Online Marketing, Legal Issues, and SEO etc. You can add him on Google+.